In light of last week’s national Pride Of Britain Awards, RIASA were proud to be able to attend the local version of this earlier last month when RIASA Director, Mark Ellis, sponsored a table at The Yorkshire Children of Courage Awards. , RIASA staff and student-athletes were delighted to be able to join both other businesses and celebrities at the Yorkshire Children of Courage Awards on Friday 12th October at the Royal Armouries in Leeds, Mark Ellis had sponsored a table in support of this local, truly worthy cause. A wonderful night to celebrate the amazing young people of Yorkshire, included a short speech given by Rob Jones (Head Academy Coach), who was one of those chosen as part of the team giving an award to Bailey Matthews, of the ‘Be More Bailey’ Foundation, which promotes disabled children in sport. This young man is motivational for all young disabled people and RIASA were proud to have been chosen to be part of him receiving his well-earned award. All this was combined with great entertainment from a live band, and singer, alongside a 3-course banquet provided by Aagrah restaurants. Mark was blown away by the young people receiving the awards, saying “One of RIASA’s core beliefs is that you need ‘to put in to get out’ and so been able to support this amazing annual Yorkshire event was important to emphasise this. This was particularly enjoyed by a group of RIASA student-athletes who had also volunteered to assist in raising money by selling raffle tickets through the night and actually managed to raise a total of £6,370 from this alone. 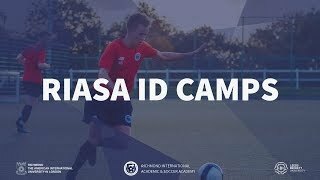 Well done to all those involved, and something else Mark was very proud to hear, as well as all the fantastic comments from the organisers of the event saying what lovely, well mannered, young men RIASA students were.